After almost 50 years, we're getting rather familiar with Mars. We have spacecraft images dating back to 1965 and chemical evidence from lander missions beginning in the 1970s. For years, orbiters have been recording the surface of Mars in spy-satellite detail. And Mars has sent actual rock specimens our way in the form of meteorites. A paper in the March 7 issue of Science argues that most of the Mars rocks in our collections come from one place, a big young crater named Mojave. Rocks from Mars are a rare component of the hundreds of thousands of meteorites we've collected. They're flung into space when cosmic collisions on Mars blast craters in its rocky crust, then they drift around the solar system for a while until Earth's gravity draws them close enough to fall. We have about 150 specimens in our hands. Nearly all of them are the same rock type, given the name shergottite after the meteorite named Shergotty, which fell near Sherghati, India, in 1865. It's a heavy, magnesium-rich mix of the minerals olivine, pyroxene and feldspar that is similar to the so-called ultramafic rocks of our own oceanic crust. The Science paper reports efforts to trace shergottites and other Martian meteorites to their source. The research team, consisting of Stephanie Werner (University of Oslo), Anouck Ody (Lyon University) and François Poulet (Paris University Sud), first presented their work at the Lunar and Planetary Science Conference last year in Texas, but this paper marks its formal publication. The authors had several facts at their disposal. The Martian stones consist of a well-known mix of minerals that can be checked against satellite observations of the Martian surface. They have a controversially wide range of age determinations, with most being more than 4 billion years old and a few as young as 150 million years old. And they have been exposed to cosmic rays for as little as 1 million years. This represents the time they were floating in space before falling to Earth. Werner's team then made a new search for the youngest craters on Mars. These are best known from their fresh appearance and the presence of dust deposits that form a star-shaped pattern. The rays don't show up well in ordinary light, but thermal images taken at night display them well. 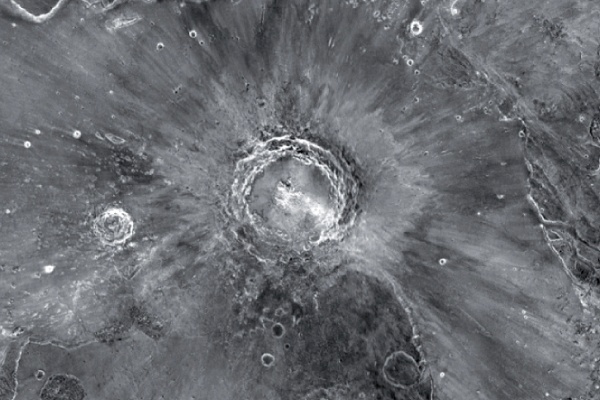 A prevous study found eight of these rayed craters, most of them only a few kilometers across. Only one of that group, Zunil, is large enough (about 10 km across) that the energy spent in forming it could have launched rocks free of Mars's gravity. The new, more thorough search turned up 14 more rayed craters, of which the largest by far is Mojave, 55 kilometers across. It sits in Xanthe Terra, an area with some of the oldest terrain on Mars. Crater counts, the standard method of dating planetary surfaces, suggest that Xanthe, along with the rocks beneath it, is 4.1 billion years old. The researchers took a close look at the rocks exposed in the crater and found many localities that matched Mars meteorites in colorand by "color" I mean the range in light wavelengths going far beyond the red end of the visible rainbow. 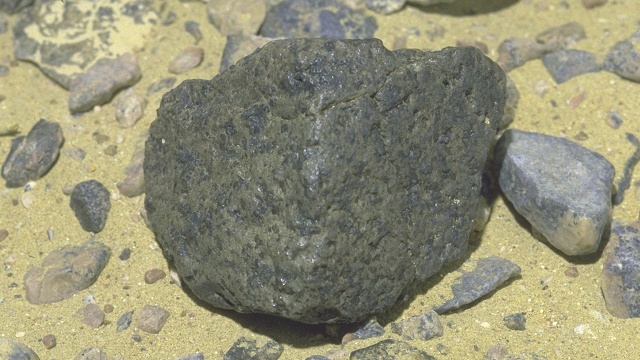 Given the size of Mojave, the consistency in ages between the terrain and the meteorites, and the close match in mineral composition, the authors are confident that the shergottitesand, for good measure, the controversial meteorite ALH84001"were sourced from the Mojave impact site." With that, Werner's team offers an explanation for the unusually young ages determined in some of the shergottites. These are not real ages, they say, but "reset" ages. A lot has happened at Xanthe Terra, by Martian standards. Since the time the ancient rocks formed some 4 billion years ago, volcanism and flooding during the next billion years left their traces behind in the landscape and, presumably, in the rocks as well. Shock waves from other impacts affected these already-altered rocks. For instance, the feldspar in most shergottites was shocked out of crystallization into the glassy form called maskelynite. The ages of these events may be reflected in dates derived from various specific minerals, whereas when the whole rock is dated the ages exceed 4 billion years. Finally, just the other day in geological terms, a giant impact onto Xanthe Terra created Mojave crater and propelled the shergottites into space. All of this geologic history can upset the isotopic clocks in the rocks, turning part of their signal into noisebut now that the noise has plausible explanations, maybe it can be turned into a signal of new knowledge about Mars. Pinning down the source of the shergottites is a cool thing, but Werner's team points out in the Science paper that something more fundamental has been achieved. We now have pinned down the exact age of Xanthe Terra with absolute dates, and from that we can recalibrate the crater-counting dating method to determine Mars history more precisely. Where once we considered Xanthe to be 4.1 billion years old, they say, we now can say that it's 4.3 billion, and the rest of Mars can be studied with new precision.